List Rules Vote up the trash talk that went for the jugular. Vote down the smack talk that wasn't even offensive. Trash talk in the NBA is something of an art. If you’re gonna trash talk, you’ve not only gotta be able to back it up, you also have your own style. Some harsh NBA trash talk is funny, some of it confusing, and a lot of it straight up mean, meant to throw opponents off their game. Some players who lived through funny basketball trash talk were able to dust themselves off and keep playing without missing a step. Others were never the same again after getting burned. There’s no normal NBA player trash talk; some guys go straight for the jugular and insult everything from a player’s mother to his wife, while other players are content to focus on someone’s looks and lack of skills to pay the bills. The late '80s and early '90s were the heyday of NBA trash talk, and while it seemed like talking smack was a dying art form as the 21st century began to rear its ugly head, players like Kevin Garnett and Russell Westbrook are making sure the not-so-subtle art of trash talk stays alive. Vote up the NBA trash talk that went hardest in the paint. Vote down the smack talk that wasn’t even offensive. If you’re Kevin Garnett you can pick up your Trash Master trophy at the Ranker offices. In a game against the Utah Jazz, Michael Jordan dunked on 6'1" guard John Stockton, which prompted Larry Miller, owner of the Jazz, to yell "pick on someone your own size!" On the next play, MJ dunked on Mel Turpin, Utah's 7'1" center, turned to Miller and asked something like "Is he big enough for you?" It's probably a good idea to never talk sh*t on Michael Jordan, no matter who you are. You especially shouldn't talk smack on MJ when you're some no name scrub on the Vancouver Grizzlies. Darrick Martin elected not to heed this advice and, in the fourth quarter of a game during which the Grizzlies had a lead, ran by the Bulls bench and said to Jordon, "I told you we were gonna beat you tonight." Jordan got off the bench, checked himself into the game, addressed Martin briefly (“Little man, I told you not to trash-talk me.”) and scored 19 points in the last six minutes of the game, securing a win for Chicago. Muggsy Bogues, the hero of all short men everywhere as well as anyone who spent too many quarters on NBA Jam, met his match when he went face to face with Michael Jordan in 1995. 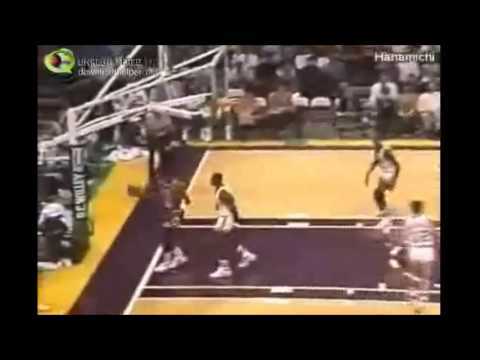 During the game, Mugsy had the ball with the Hornets down one. Jordan, who was guarding Bogues, backed off and told him: “shoot it you f*cking midget.” Mugsy shot the ball and bricked it. A year later Mugsy said he believes that play ruined his career and his shot never recovered. Kevin Garnett and Tim Duncan have never had a good relationship. Some might say the two veteran players hate each other, but hate doesn't feel strong enough. There's loathing between the two that permeates the air around them. Garnett has slapped Duncan in the head, whispered really weird stuff in his ear, and in 1999 he allegedly said, "Happy Mother's Day mother f*cker" to Duncan, who lost his mother to breast cancer the day before his 14th birthday. We're going to need a bigger YIKES. Even if this is just a rumor, the fact that people are still talking about it transcends trash talk and brings it into the realm of pure evil.